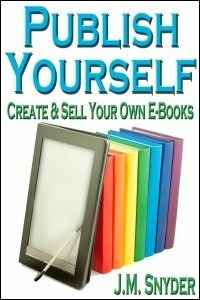 This week I published my first nonfiction book, a hands-on how-to entitled Publish Yourself: Create & Sell Your Own E-Books. If you’ve ever wanted to retain more of your royalties or try publishing e-books but didn’t know where to start, this book is for you! Recently e-books have exploded onto the publishing scene, making it easier than ever for writers to break into the market. But many people who read e-books aren’t familiar with how to create them. What formats should you offer? Where do you sell them? What do you use for a cover? And, most important, how do you go from a Word document to an EPUB, MOBI, or PDF file? Best-selling, multi-published author J.M. Snyder has written this no-nonsense, hands-on guide. She takes the mystery out of e-publishing while making the process of creating an e-book simple, cheap, and easy. Using Microsoft Word (or an equivalent word processing program) along with inexpensive or free software readily available online, you will learn how to create the nine most common e-book formats. You will be walked through cover art design, interior book layout, and e-book creation, as well as given many of the tips J.M. has learned along the way. Also included is a brief guide to online bookstores where you can sell your finished e-book. Let J.M. Snyder help you discover how easy it is to publish yourself!